🤔 the receiver is tasked with guessing who the gift-giver was! We thought it’d be particularly fun to do it #rstats style. 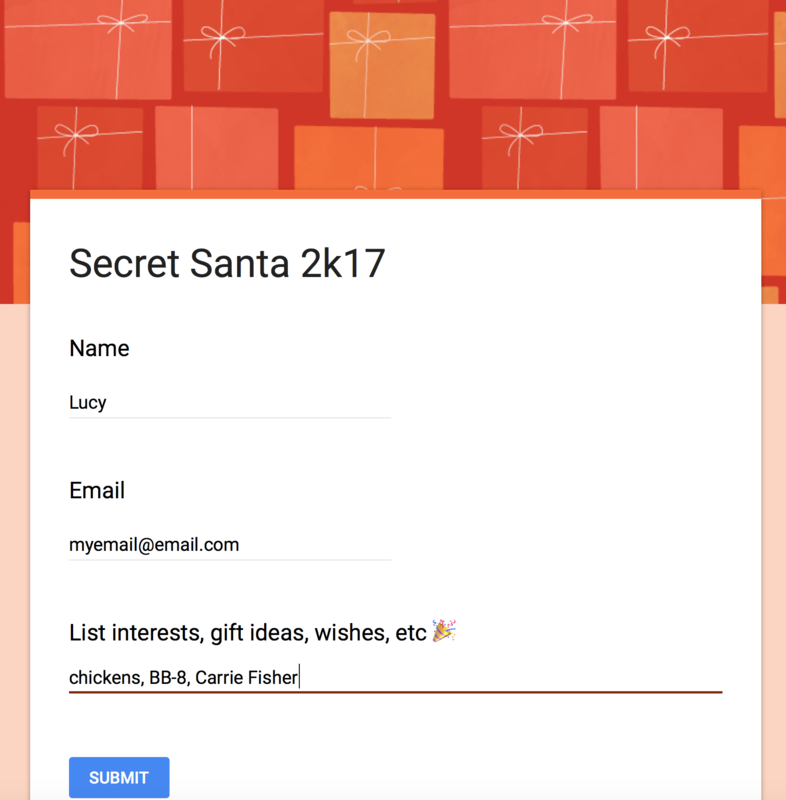 We had our interested classmates sign up on a Google Form, ⊕ resulting in a Google Sheet with each participant’s name, email, and interests. We began by making a tibble that has name in the first column and assigned a random partner in the second. “But what if someone was assigned to be their own partner!” you may ask. ⊕ Have no fear! A while loop is here! We allow a while loop to iterate until every individual is assigned a partner (who isn’t them!). This is likely not the most efficient way, but we only had 23 friends so it’s 👌 – if you get excited about efficiency and would like to share a quicker way to do it, please do! We ❤️ to learn! Edit: Looks like our 🙏 was answered! What if you just did sample(names) and everyone was assigned to give a give to the next person in the vector? We then do a join to pull the emails and interests back in. Karthik and I had a blast at the rOpenSci unconf creating the 🐴 ponyexpress package - what a delightful chance to use it! We didn’t want the secret to be spoiled (i.e. we didn’t want to know who would be buying us gifts! ), so we wrote a script to send an email to our classmates. Remember, the price limit is $20. And that’s it! Happy gift-ing 🎁!